A recent report by the United Nations has projected that by 2050 there will be more than 2.1 billion geriatrics; people aged over 60 years, in the world, which would be more than double of approximately 962 million geriatrics as of 2017. The UN has highlighted that the percentage of geriatrics in the world’s population is growing faster than all younger age groups. While this escalation in geriatric population is a result of increased life expectancy and improved healthcare infrastructure across various countries, it also is providing traction to the physiotherapy equipment market, as elderly people are highly prone to mobility disorders. According to this business intelligence study, the demand in the global physiotherapy equipment market will increment at a notable CAGR of 6.9% during the forecast period of 2017 to 2022. In terms of revenue, there will be opportunities worth US$23,750.9 mn by the end of 2022. Besides rapid rise of geriatric population, the global physiotherapy equipment market is also driven by a number of other factors such as favorable healthcare reforms in various emerging economies, rising number of baby-boomers who are approaching retirement age, growing prevalence of cardiovascular and neurological diseases, and high employment rate. On the other hand, shortage of skilled professions to operate the specialized equipment, lack of standardized reimbursement scenario for physiotherapy, emergence of alternative services such as acupuncture, and high maintenance cost are a few restraints curtailing the prosperity of the physiotherapy equipment market. 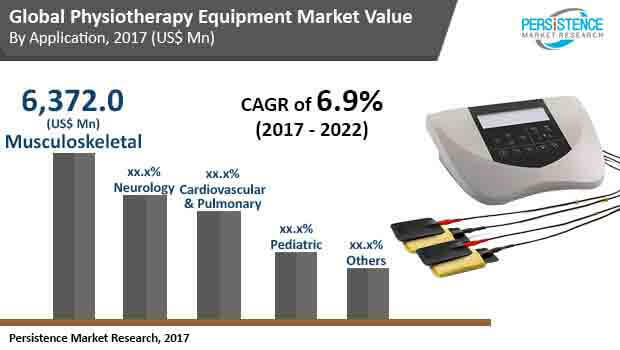 Nevertheless, the vendors operating in the physiotherapy equipment market are expected to gain new opportunities in vastly populated emerging economies of India and China as well as recent technological advancements such as exoskeletons, virtual reality, robotics, interactive video games, and implanted devices. On the basis of product type, the physiotherapy equipment market has been segmented into equipment, accessories, and others. The equipment segment has been further bifurcated into hydrotherapy, continuous passive motion, electric stimulation, heat therapy, cryotherapy, ultrasound, and therapeutic exercises. Moreover, the accessories segment has been sub-segmented into orthoses and others. As of 2017, the equipment sub-segments collaboratively provided for a revenue of US$11,183.7 mn, although the accessories are expected to gain newer demands at a slightly stronger CAGR. End user classification of the physiotherapy equipment market has been done into hospitals, clinics, and others. By the end of 2022, the hospitals segment is projected to provide for a demand worth of US$16,449.7 mn. Owing to the significant cost of these tools, most of the patients prefer to visit multispecialty hospitals or specialized clinics for the procedures. Based on application, the physiotherapy equipment market has been divided into musculoskeletal, cardiovascular and pulmonary, neurology, and pediatrics. Among these, the musculoskeletal segment is most profitable in terms of value, promising to offer opportunities worth US$9,126.1 mn by the end of 2022. The segments of neurology and cardiovascular and pulmonary are also poised for impressive growth over the course of the forecast period. Geographically, North America has been identified as most lucrative region, followed by Europe. These two regions have better healthcare infrastructure than the rest of the world and most of the pioneering companies hail from constituting countries. However, Asia Pacific has also been highlighted as a region with proliferating demand, which is a reflection of vast populations residing in the emerging economies of China and India. By the end of 2022, the North America physiotherapy equipment market is estimated to be worth US$1,387.7 mn.